Antique amethyst and pearl bracelet from the early 1900's. Antique amethyst and pearl bracelet from the early 1900’s. Product code: ES6132 Categories: Sold Items, Sold Jewellery. Sometimes you come across an antique piece of jewellery that is so unique and special it just takes your breath away such as this incredibly elegant and refined antique bracelet set with amethysts and pearls. Made in 15ct yellow and white gold, this piece dates from the very early part of the 1920’s yet still has the characteristics of the Edwardian and Belle Époque era of the early 1900’s. Set with 7 amethysts, the design surrounding each is just incredible and looks amazing both on and off the wrist. Then connecting each set of amethysts, each section of triple white gold chain is set with three natural pearls which look lovely in the white gold. The amethyst set links each measure 14mm wide and laid out end to end the bracelet measures 20cm in length and is finished off with a elegant clasp to sit securely on the wrist. 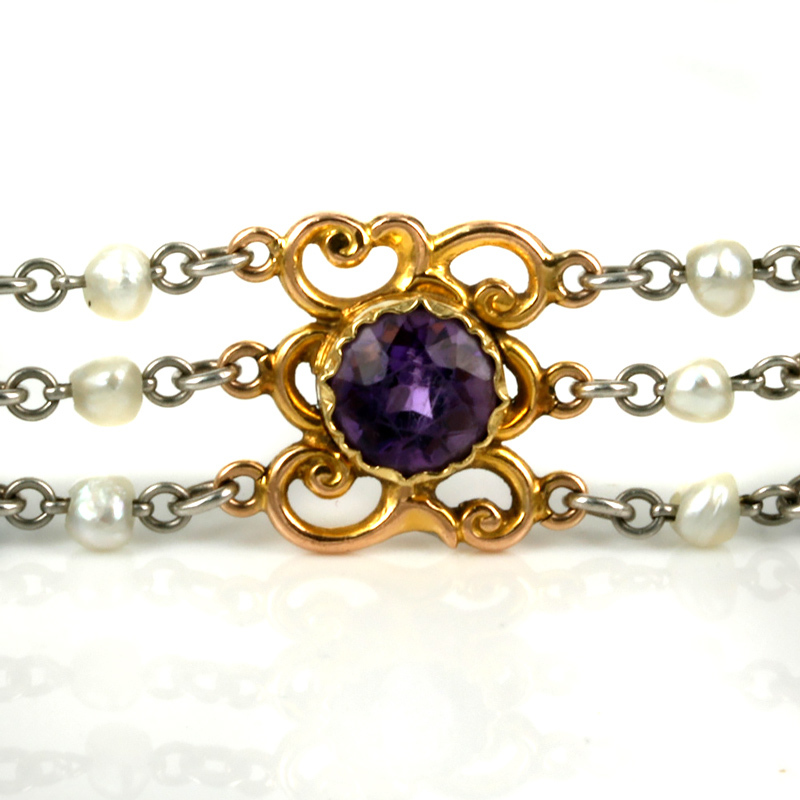 With an outstanding and unique design, this antique amethyst and pearl bracelet is simply divine.